Available in Over 80 Colors! Because the Camino Series is custom made to order, you get to choose from 21 Top Grain Leather Colors, 19 Bonded Leather Colors, or 47 Microfiber Colors. The sets are shipped directly from the factory and delivered to you by our in-home White Glove delivery service (normal delivery is 5 - 6 weeks). 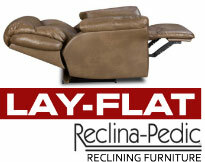 Save $200.00 on any of the matching Reclining Chairs when ordered with Sofa or Loveset. Even from across the room, the "Camino" beckons you with its double-tufted pillow back, deep seating and fully cushioned chaise-pad ottomans. You could sit for hours on the 1.8 density foam seats that boast 28 pound compression-exceeding industry standards! The hardwood frame with extra-strong hardwood components is built for durability. Quality is everywhere. The Camino features both the new Reclina-Pedic and LayFlat technology. The Reclina-Pedic feature uses thick memory foam to cradle your body in relaxed comfort that soothes your muscles. The new LayFlat feature allows you to recline the chair in to flat position ideal for resting or sleeping. 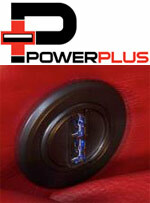 Power Plus provides you with 2 USB charging ports (in the power recline controller) to charge your mobile devices. American Quality and Craftsmanship in every Stitch. Luxurious, ergonomically designed seating surfaces are sculpted 1.8 density foam with an amazing 28 pound compression and covered with a layer of visco-elastic memory foam that will keep you comfortable for years. 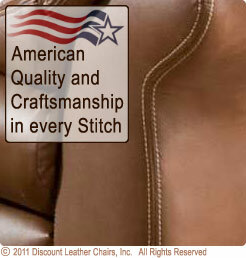 American Quality is built right into this reclining furniture. The frame is hardwood with hardwood components for extra durability. The reclining mechanism has thick gauge steel and Longlife rivets that stand up to the most demanding family life. The Camino Series is as comfortable as any Sofa Group seating made. It is an elegant addition to your home and is an excellent investment in American Made Comfort and Quality. Through use of the industry's most stringent Quality Control monitoring over the last 14 years, independent audits show that this American Furniture is a remarkable 99.4% defect free. The factory (based in Mississippi) also has an equally impressive record for shipping 98.7% on time. Why Buy American made Furniture? Aside from the obvious reasons of supporting American jobs and industry the simple fact is this American Made Furniture is not only better made than a Chinese import, but is a much better value. From the quality of the springs, frame, and foam, to the final stitch, everything that goes into this furniture is superior in quality. The black metal patented parts of the RECLINING MECHANISM carry a Limited LIFETIME Warranty. The reclining mechanism is warranted to be free of defects for as long as you, the original consumer, own the furniture. Sleeper mechanisms, mattresses, cushions, wooden frame components and springs are warranted to be free of defects in materials and workmanship for FIVE (5) years from the date of sale. Motors, massage units, wiring, hand wands and all other electrical components are warranted to be free of defects in manufacturing and workmanship for ONE (1) year from the date of sale. American Made warrants all our upholstery fabrics and leathers against defective materials and workmanship for ONE (1) year from the date of purchase. This warranty covers seam failure, fabric separation and nap loss. Excluded from warranty are cover pilling, fading, stretching and dye lot variations. Natural markings such as scars, brands, grain variations, wrinkles, bug bites, etc., will be considered normal characteristics and not construed as defects. Nature's trademarks leave no two cowhides the same, so color variations could occur. Where there is evidence of excessive soiling, improper cleaning, abuse, or where the fabric or leather has had some form of chemical applied, the fabric / leather warranty will not apply. The Manufacturer will honor reasonable and customary labor charges for a period of one year from the original date of sale for the purpose of repair or replacing warranty parts.